All of our outdoor custom cushions come standard with zippers, premium dacron wrap, UV resistant thread and a protective internal lining for the ultimate in comfort and durability. We offer a variety of outdoor performance fabrics including Sunbrella, Outdura, Tempotest, and other styles of outdoor rated furniture fabrics by Kravet, Duralee, Robert Allen, Schumacher and more. Whether you are looking for replacement outdoor cushions for furniture you already own or you are working on a custom project such a custom window cushion, we can custom craft anything from a chaise cushion to oversized seat cushions. We can work from sizes you send us or if you have a pattern for a custom cushion you can send that to us and we can digitally reproduce and template the exact size and measurements that your require. We are also offer custom Sunbrella embroidery and since we have large format machines, we can personalize any outdoor cushion or pillow to your tastes using a UV resistant Sunbrella embroidery thread. We have many styles and sizes in our database and can easily provide replacement cushions for Brown Jordan, Front Gate, and other furniture manufacturers. Replacement outdoor cushions are a great way to revitalize your current furniture set without the need to replace the entire arrangement. All of our replacement cushions are made right here in our Clearwater, Florida location and are hand crafted using tough, UV resistant thread with premium foam and Dacron wrap. Window and bench cushions are a great addition to create an inviting atmosphere and we can make oversized bench cushions to fit any window seat. Imagine spending a lazy day by the window, looking out into the garden, or reading a book, while enjoying a comfortable oversized bench cushion that is plush and custom made to fit your window seat. Window and bench cushions are a great way to add a piece of comfort to your home and provide a great place to relax and unwind. Add a custom bolster or throw pillow using a coordinating fabric and you have a place you can easily call your own. 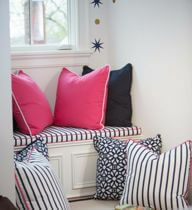 Adding bolster or throw pillows can create comfort and added style to any space. If you already have a pillow insert, we can make just the throw pillow cover or create a new outdoor throw pillow set. 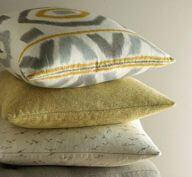 Custom throw pillows are a great way to switch out the design of an area based on a season or application. Having different set of custom throw pillows or bolster pillows for different holidays are a great way to subtly change the look of a room or outdoor patio. We can make outdoor throw pillows or indoor throw pillows and we can even include zippers for easy removal of the throw pillow cover. Sunbrella Rain fabric is the first completely waterproof Sunbrella upholstery fabric to be on the market and we are certified manufacturers in this special process. Created with a special interior flap, the air is able to be released from the cushion while preventing moisture from coming in, making it the only, completely waterproof outdoor cushion on available on the market. 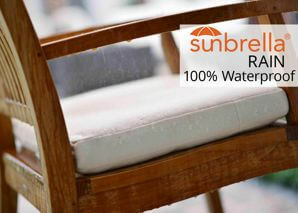 With Sunbrella Rain fabric, if the cushion gets wet, simply shake it off, and it is dry within minutes. No more waiting for the foam to dry out before being able to use the cushion again. We offer a variety of outdoor chaise lounge cushions with and without mesh bottoms and using either an outdoor upholstery fabric or mesh fabric such as Phifertex or Textilene. Whether it’s an outdoor chaise cushion that is one piece, two pieces, with or without ties or zippers, we can create custom outdoor chaise lounge cushions perfect for the poolside or beach. Combine it with a custom chaise lounge cover, customized with outdoor Sunbrella Embroidery Thread, and you end up with something truly unique and special and with the possibility of adding your own design touch to your outdoor seating area. 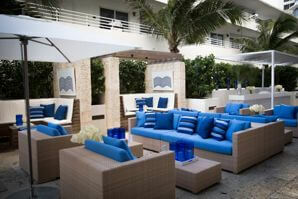 Although we specialize in custom outdoor cushions, we can help you with any indoor cushion project too! You can choose to use an outdoor rated fabric, such as Sunbrella on the inside and why not? Sunbrella is pet friendly, kid friendly, and party friendly so clean up is a breeze. 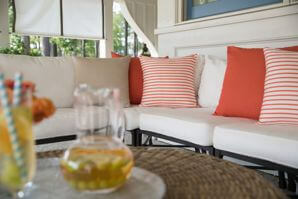 Sunbrella fabrics are just as soft as indoor décor fabrics and are a great choice for the inside too! We also have 1,000s of other choices in interior décor fabrics suitable for upholstery, bedding, or drapery applications. 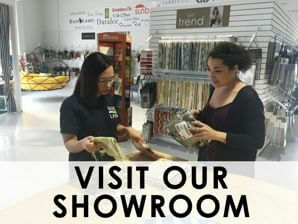 We even have some fabric lines that are exclusive to us and if you’re ever in the Clearwater, Florida area, be sure to shop by our fabric design center and we can even offer you some free Sunbrella samples to take home with you. 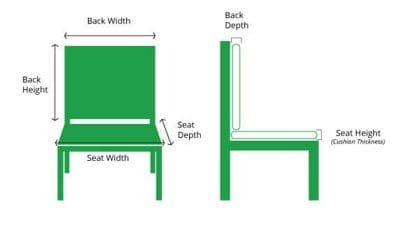 For custom cushions that require a back portion, we can shape the back cushion into a bolster, so that the size tapers off towards the seat portion of the cushion which promotes better back support. It’s the little things that can make a big difference in outdoor seating sets and when considering the size and shape of the cushion, we can recommend a variety of bolster options for the custom cushions that will give your guests the optimum comfort and support. 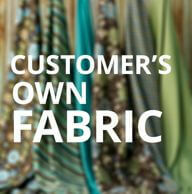 We offer 100s of contract rated outdoor upholstery fabrics from Sunbrella, CF Stinson and Mayer fabrics. We work with architects to create custom commercial cushions to their exact specifications. Our outdoor commercial cushions are designed to be used on a daily basis and can withstand the rigorous requirement of being used in the hospitality industry and being exposed to sun, wind, and rain. All of our contract cushions meet the Wyzenbeek double rub standards and can be made with a variety of canvas, vinyl, or mesh fabric choices. Have a fabric that you love? No problem. We never charge extra for supplying your own material and we make custom cushion covers and replacement cushion covers all the time using COM fabric. We work with customers all the time to create special custom cushions and covers. We’ve made everything from playset canopies, to stadium seat covers, and even Sunbrella dog beds and Sunbrella ottomans and recovers. Send us your specification and your fabric and we can create a custom cushion or cover just for you. We offer a variety of in house upholstery services including headboard covering and marine and boat cushion fabrication. 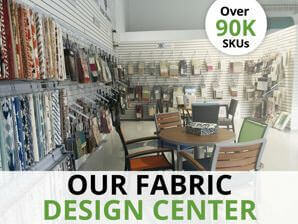 If you’re in the Tampa Bay or St. Petersburg/Clearwater, Florida area, you are welcome to stop by our fabric design center where we have many associates who are experts in Sunbrella fabric and other interior fabrics. If you bring us some design styles you like and pictures of the space you are trying to recreate, we can help you choose the right coordinating fabrics to help bring together all of the design elements that are custom to you. Whether it’s for your home, your boat, your office, or your outdoor patio, we can help you create custom cushions, custom pillows, custom drapes and more. Patio Lane also offers other outdoor living products such as Sunbrella umbrellas, outdoor furniture, outdoor rugs, propane and electric outdoor patio heaters, fire pits and fire bowls as well as shade sails and other modern shade elements. We have the largest collection of Sunbrella fabrics and can offer the Sunbrella fusion and Sunbrella select fabrics as choices for any outdoor cushion project. In addition we carry many designer brands of Sunbrella such as Kelly Wearstler Sunbrella, Richard Frinier Sunbrella, Laurie Bell Sunbrella, and many more. Sunbrella fabrics are known in the industry to be beautiful, durable, and a great choice for both inside and outdoor fabric applications. In addition we carry all of the major and boutique fabric brands from Schumacher, Fabricut, Kravet, Duralee, Trend, and Robert Allen, as well as many other smaller boutique fabric brands. Can’t find the right fabric? Let us help you. We can source fabric from all over the world and we even offer Sunbrella embroidery on all of our custom cushions and covers. If your outdoor cushions are going to be exposed to any weather elements, we recommend using a Dri Fast Foam which is designed, when it gets wet, to dry quickly. Dri Fast Foam is available in a variety of levels of firmness and sizes. Although the standard is a 3” depth, for a lot of replacement outdoor cushions, a bigger depth of 4 or 5 inches is sometimes appropriate. You also have to consider if your custom cushions will be used every day such as, an eat in dining booth. For indoor applications, we can use a 100% latex or polyurethane foam designed to be used daily without softening or flattening out over time. When you measure your furniture from the ground up, we recommend that the cushion finish anywhere between 18 and 20 inches. This will take into consideration when you are using an extra thick cushion of 4 inches or more so that your final cushion product will be the right height for you. 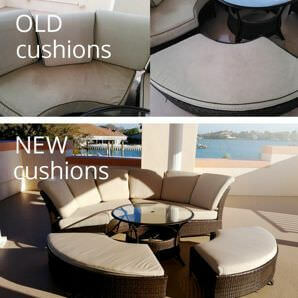 We welcome all sizes, shapes, and specifications for custom outdoor cushions and replacement cushions. We specialize in all things custom and our cushion experts can help you thru the process of choosing the perfect fabric, the perfect size of cushion, and can even jazz things up with a different color welting for your custom cushion. In business since 1985, our family started by creating custom outdoor shade and cushion solutions for the Tampa Bay area. We have been fortunate enough to be able to expand our offering across the U.S.A. and even into the Canada, the Caribbean, and Central and South America, offering custom cushions and fabric by the yard across the globe. Our team of people has steadily grown and without them, Patio Lane, would have never been possible. Each one of your custom cushions and covers is hand crafted in our facility, located in Clearwater, Florida, which makes us proud to say they are all made in the U.S.A.